The Manhattan Transfer is an American mixed music group. There have been two manifestations of the group, with Tim Hauser being the only person to be part of both. The name comes from John Dos Passos' 1925 novel Manhattan Transfer and refers to the group's New York origins. The group signed to the Telarc label in 2003 to release Couldn't Be Hotter, a live performance capturing many of the songs from The Spirit of St. Louis. In 2004, the group released the album Vibrate. This was another one of their “pastiche” albums, blending original tunes with older ones, pop, jazz, funk, etc. Vibrate featured such notable musicians as bassist Will Lee and renowned time-keeper Steve Hass on drums. They also released, first in Japan, their second holiday album, An Acapella Christmas, in 2005. The album was released in the U.S. in 2006. During 2006, the group released The Symphony Sessions, a collection of some of their best known songs re-recorded with an orchestra, and also The Definitive Pop Collection, a two-disc collection of the group's material from their time with Atlantic Records. They also recorded their first original title song for a movie, "Trail of the Screaming Forehead"; and, in late 2006, the group released a new concert DVD, The Christmas Concert, and was broadcasted by PBS in select locations. The band's latest album, The Chick Corea Songbook, is a tribute to the works of American jazz musician Chick Corea and was released in September 2009. The album features an appearance by Corea himself on the track "Free Samba". Other notable musicians on this recording are Airto Moreira, Scott Kinsey, Gary Novak, Steve Hass, Alex Acuña, Jimmy Earl, John "Jellybean" Benitez, and Christian McBride. 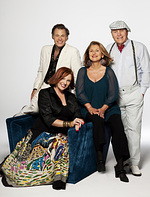 As of October 2011, The Manhattan Transfer are finishing an album of previously recorded, but never finished, songs to honour their 40th anniversary. “We are working on a project now that is called The Vaults. Over the years, there are a lot of different songs that we recorded but never finished. We pull out from the archives a lot of these songs and are finishing them,” said Alan Paul in an interview for Jazz FM radio in Bulgaria. One of the highlights of the album will be a vocalese version of George and Ira Gershwin’s The Man I Love, based on an Artie Shaw and his orchestra performance of the composition, which had been slated for the Swing album. “I wrote lyrics to Artie Shaw’s clarinet solo and then to all the other parts underneath. We become the vocal orchestra for Artie Shaw’s orchestra. The rhythm track was done with Ray Brown on bass, Yaron Gershovsky – our musical director – on piano, David Hungate on guitar and Duffy Jackson on drums. It was a wonderful track and we never got to do the vocals. So now we are in the studio putting down the vocals. This is like a dream come true for me because it is such an incredibly beautiful piece of music. After all these years to finally hear it being finished and done, is really wonderful”, said Alan Paul.